Star Wars is on everyone’s mind right now. With the release of Episode VIII: The Last Jedi and the Disney train going full speed ahead on the franchise, it’s difficult to not find someone talking about Star Wars. Two years after EA rebooted the Star Wars Battlefront franchise we’re now seeing a sequel hoping to bring the video game series forward. What happened though is a different story. There’s a reason we’re writing this review almost two months after release. 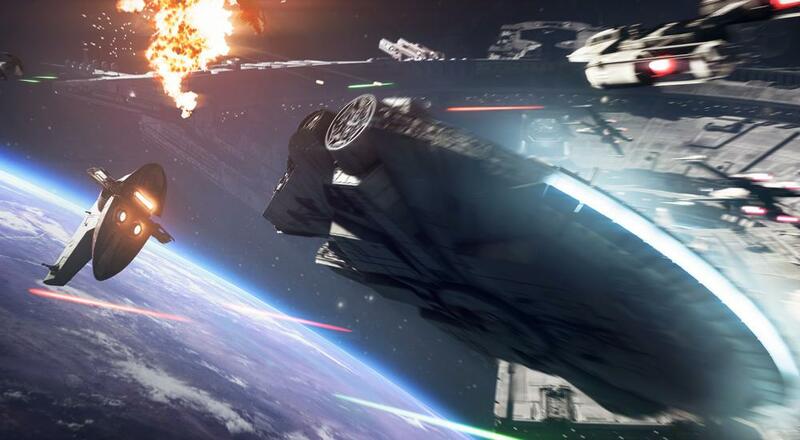 EA’s “loot crate” fiasco dominated the launch of Battlefront II. In short, the game was rigged heavily against the player in order to entice them to purchase loot crates with real world cash for the *chance* of getting their favorite Star Wars hero to play as. The alternative was a ridiculous grind of playtime. It didn’t go over well. EA backpedaled, removed the ability to actually spend dollars in game, and lowered in game cost to help alleviate the grind. The reason behind this system was in a way to fix what was the biggest gripe with the first game, fractured player base because of staggered DLC ownership. With every content release came a smaller pool of players to play with. So EA has made all DLC free, including the recently release Last Jedi maps and characters, so everyone can enjoy the same game for the life of the product. But the consistent influx of cash into the series is now gone, and we may lose future content because of it. With those unpleasantries out of the way, let’s talk about the actual game. First off Battlefront 2 addresses the second biggest gripe of the first, it now has a single player campaign mode. Players jump into the shoes of an Imperial special forces agent immediately following the Battle of Endor from Return of the Jedi. Without giving too much away you’ll follow Iden Versio over the next few years and get an interesting look at the Empire’s perspective of the most famous galactic war. Thankfully the game isn’t solely a shooting affair, with a good mix of vehicle and space combat missions to break things up. You’ll even jump into the familiar shoes of Luke, Han and Leia from time to time. There are even some adventure style sections with interactive dialogue and such. Overall I really enjoyed the story, found it a good way to get familiar with some of maps, and was a nice distraction from the game’s core multiplayer mode when I got tired of that from time to time. EA has even released some free story based DLC for players to enjoy once you complete the campaign, which took me around 6 hours to do. 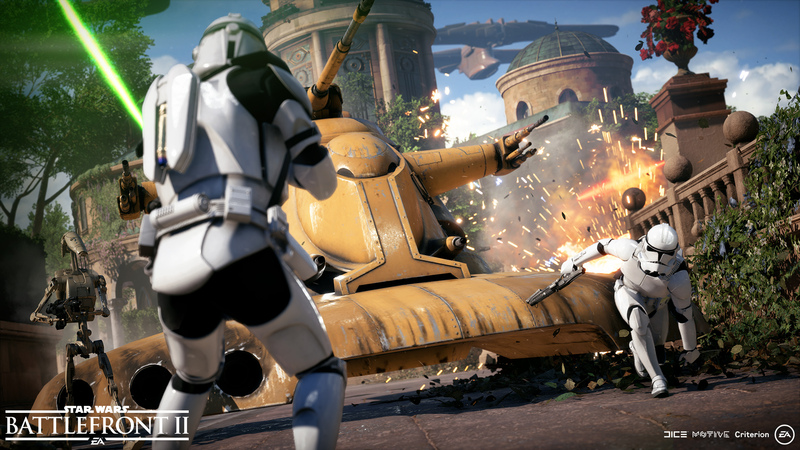 But the core of Battlefront II is still the game’s competitive multiplayer modes. Easing you into this is a mode called Arcade which lets you take on AI bots in various scenarios with score and objective goals. It’s here you’ll refine your skills before hopping into the actual online modes. Returning is a 40 player (20 vs 20) mode with multi-tiered objective based missions called Galactic Assault; definitely the centerpiece. You also have Blast, Strike, and Heroes vs Villains as smaller affairs. New this year is a dedicated space combat mode called Starfighter Assault. What I really like about all of these modes is the revamped risk vs reward system. Instead of randomized pickups throughout the map, players earn battle points which can be spent once they die. It’s here you can play as more fortified fighters like Wookies and Rocket Troopers or save up a little bit more to hop into an AT-ST or speeder bike. The top tier of purchases are Heroes, spawning in to help turn the tide of battle. It feels like EA has taken a few cues from MOBA style games here, and I really like this method of balancing multiplayer vs something like kill streaks that Call of Duty games have made popular. Overall there’s plenty of maps that span all three of the trilogy’s eras along with the characters to match. Over and over again I just imagine the 8 year old version of myself playing THIS video game versus the green polygon lines of “Star Wars” on the Atari 2600 and having my mind absolutely blown. This is the closest you will be to being in an actual Star Wars battle. Now, about that co-op. Perhaps the biggest issue is that there is no online co-op at all. There is only two player split-screen local co-op. And that’s just for consoles; if you are a PC gamer, you’re out of luck. Losing major features across platforms while charging the same price is quite frankly terrible. Not “loot crate-Gate” level terrible, but still terrible. But are PC players missing something special here? Not really. The co-op is bare bones. There’s only a handful of maps, and these are shared between playing as the Light and Dark sides. It’s the same map and objective for Luke and Leia as it is for Vader and the Emperor. The only difference is which troops you are mowing down. The survival style co-op of the previous Battlefront game was a fair way to spend your gaming time. Battlefront II’s co-op is less structured and thoughtful, and didn’t hold my attention as long as a result. Once you have played through all the maps, and seen all the heroes, there’s very little to draw you back, other than getting a higher score or opening another difficulty level. We do have some other gripes with the PC version of the game. It’s also quite picky in terms of performance - so far so I had to disable Direct X 12 support to get rid of horrible stutters. It also lost Dolby Atmos support for audio, which really makes me sad as the first game I enjoyed extensively surround sound. It just feels overall less polished, perhaps because of the loot crate distractions early on were put as a focus. Overall Battlefront II is an amazing visual achievement, it absolutely immerses you into a glorious world of Star Wars across all three eras. The story mode is a welcome addition giving the game legs where it was missing it before. The competitive modes are great to play and if you’re all about collecting and unlocking abilities and tweaks for your characters, this is where you’ll do it. But the step backwards for co-op is a huge disappointment, especially with it being omitted completely from the PC version. The bottom line here is you don’t buy Battlefront II for co-op play. The Co-Op Experience: Two players can play splitscreen co-op throughout the story campaign or a strategic Galactic Conquest campaign.There is also a "comp stomp" configuration that supports 2 players offline, 2 players splitscreen online, or up to 16 players online. Page created in 1.1674 seconds.